Mildred B.Vermont once famously wrote on motherhood, “Being a full time mother is one of the highest salaried jobs in my field, since the payment is pure love.” In essence, this is the thesis of the latest sharp and unhinged biting–rather, latching– satire on pregnancy from directors Diablo Cody and Jason Reitman (Juno). “Tully” chaperones its lead on a journey to the destination of affectionate care, not through it, accentuating the “job” portion of being a mother. It really is as candid as a look through the eyes and mind of what it means to be a mother as any you will see at the Cineplex. 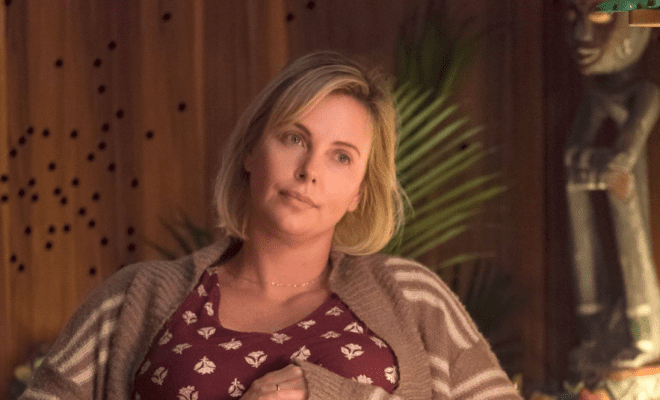 Unlike, say “Juno”, this time around we view an aging mid 30’s mother of three (Charlize Theron) as your platitude “do it yourself” kind of mom who is simply trying to survive the everyday problems that hold her down. She does the dishes, stays up to help the newborn, drives the youngsters to school in a Honda Civic, steps on Legos, and occasionally feels empty both physically and mentally–in other words, she seems like an ordinary parent. Yet Marlo (Theron) is anything but ordinary. She not only carries an excessive amount of baby weight (Theron remarkably put on 50 pounds for this role), but she also carries the weight of the world on her shoulders. But unlike Atlas, Marlo doesn’t deserve such a thunderous punishment. She seemingly has lost all joy to the mechanic cycle of bringing up her “quirky” son Jonah, who has a case of mental illness in which the doctors cannot find explanation for, one that’s caused a parade of problems for his elementary school. On top of that, she has a newborn and an ever curious adolescent daughter, so yeah, you could say she has her hands full. It also doesn’t help that she must invariably take the call of duty, since her distant and always timid and traveling husband (Ron Livingston) spends his free-time playing just that. Noticing his sister’s troubles, Marlo’s brother (Mark Duplass) furnishes a “night nanny”, and it is here that the movie takes a left turn into “Black Mirror” territory, evoking the harsh blend between supernatural and realism that the two directors set out to accomplish. After a great deal of resistance–and an even greater deal of introversion– she (and the audience) come to the understand that for Marlo to regain her freedom and a revitalized youthful spirit, as well as have time to enjoy her kids, she must accept the night nanny. And so enters Tully (played by the animated Mackenzie Davis), a strikingly young and intellectual aide who seems as much of a vital cog in the story as an occasion and or mouthpiece for the directors wit–she does after all have “more fun facts than an unpopular 4th grader”. Tully is more than the odd woman that shows up at your house in a lifetime movie and leaves the damsel in distress with a cane–though Marlo does conclude the film with a cane– she takes the form of a mystical doula of sorts, one that sneaks in at night with honorarium gifts like the tooth fairy, or perhaps a mermaid who will help her get above ground. As if she was babying the mother, rather than the children, Tully caresses Marlo with poetic bedtime stories that equally reveal as much about Marlo as it does the about the labyrinthine world in which she lives. “Tully”(the film that is), rarely if ever seems overworked. No matter the weariness that submerges Theron’s exterior, the movie is always lively, conveying droll situational humor and one liners that skip over the picture’s meaningful purpose. Despite the constant urge to play with its food instead of cutting to the chase, this really is a remarkably fun watch. Take the montage scenes, for example, where effervescent and devastatingly familiar cuts of daily household complications are interwoven to the rhythms of the upbeat piercing score. As we often do throughout, admire the sheer physicality of Theron’s triumphant performance which makes the struggles of her prior character Furiosa in “Mad Max:Fury Road” seem like a walk in the park in comparison to the toxic wasteland that she drudges through here. Her lashes of frustration and antithetical sullen pride aim for the heart, but when the movie really hits is after its “Babadook” inspired surprise, in the wonderfully simplistic final frame that speaks volumes on parenting. Because really, parenting is not just lullabies and kisses (you would have to be delusional to think that); but if you can put all the growing pains behind you, it truly is a magical thing.